Everyone knows that keyword research is a crucial component of an effective SEO campaign. Yet, finding useful keywords is an ever-evolving challenge for marketers. Sure, you can use the Google Keyword Explorer, SEMrush, MOZ, or Ahrefs—but so can your competitors. The reality is that they probably do, and when you use the same tools, you get the same keywords. Industry publications tend to be a treasure trove of keyword ideas. Let’s say you sell a software to financial executives like a CFO, VP of Finance, or Director of Finance. You might start by searching “CFO news.” In doing so, you’d see results for cfo.com, cfodailynews.com, and CFO dedicated sections in Entrepreneur and The Wall Street Journal. You could start with cfodailynews.com and dig into the topics being discussed in their articles. For example, you’d find articles about “paid leave tax credit,” “employee fraud,” and “per diem rates for fiscal year 2018.” These could make great seed keywords. But wait, there is an entire section full of articles about hiring tips for finance managers—lightbulb! That would probably make a great pillar page and topic cluster considering that senior-level executives are often responsible for hiring and hiring strategy. This is just the beginning, when you dig into multiple industry publications, especially those that have been around for a while, you will begin to surface useful keywords that may not have come up in a keyword tool. Persona interviews are an amazing way to understand your ideal buyer and tailor your marketing to that buyer’s needs. However, it’s easy to look at the broad strokes and stop there. It’s incredibly useful to look at the exact words they are using when they discuss their challenges. They’re not just words, they’re keywords! If you can, record your persona interviews. Listen to those recordings and write down everything that sounds like a keyword. This should give you a great list of seed keywords, which you can use keyword tools to expand upon. The best part? You already have your keywords and their respective content aligned to a specific buyer persona! Industry forums are another excellent place to identify keywords. 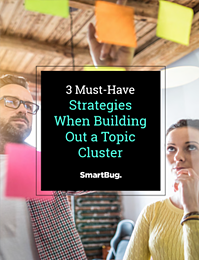 Don’t just think of industry forums from your perspective, though. As always, it’s about your customers and where they hang out, not about where your peers discuss the industry. Let’s say you’re a convention and visitors bureau or destination marketing organization in Minnesota looking to drive more traffic to your site. You might start by looking at a site like TripAdvisor, where there are over 5,000 discussions related to travel in Minnesota. Here you might see a question like, “How do I cross in and out of Canadian waters by canoe?” Knowing that the Boundary Waters Wilderness Area is a major destination for outdoor enthusiasts and that you have a persona named Outdoor Oliver, it seems that an article discussing this topic would make a lot of sense. Not sure where to start? One of the best places to look is Reddit, where you can find a forum related to just about every industry. This is a good place to hunt for keywords even if you know of only a few industry-specific forums. Generally speaking, Google Search Console is one of the most powerful tools you have to support your SEO efforts. Not only that, but it’s a completely free keyword research tool—from Google itself! Admittedly, Google also provides the keyword planner tool for free, but that’s easily the most popular tool used for keyword research. You’d be surprised by how many people I meet who haven’t even set up their Google Search Console account, much less use it for keyword research. If you go into your account, you can dig into the queries section. Take a look at the queries for which you rank 11 and higher. Now ask yourself: Do I have content that addresses the intent of these keywords? If your answer is yes, you probably need to reevaluate your on-page SEO for the content you’ve already created. Do you use that exact keyword? How many times? How often do you use related keywords in the content? Asking these types of questions will guide your page updates. If the answer is no, you now have a new content idea. Think about what the user is most likely looking for when they complete that search and create a piece of content that best responds to that intent. Don’t forget, you already had a page ranking for that keyword. When you create your new piece of content, go to the old piece of content and link to the new content using the keyword as anchor text. No, not the Google Keyword Planner tool. Take a look at your actual keyword performance in your account. First, look at the keywords themselves. What keywords have the most impressions? That gives you an accurate insight into the actual volume your keywords have. What keywords provide the most revenue? Those should take a focus. Second, look at the Search Terms tool. If you have any phrase match or broad match terms, you’ll see all the terms that those keywords trigger in the search terms tool. These terms can be quite broad and can give you a ton of great ideas for content. Imagine if you sold a payroll solution, you might have a phrase match keyword for “change payroll systems.” While looking at the search terms tool, you might find queries for “how to change payroll systems in the middle of the year” and “should I change payroll systems or finish my current contract?” Now you have new article ideas. Imagine you own a landscaping company and you want to drive more qualified traffic to your website. You might want to target the keywords, “prevent grass from dying.” You would want to plug that phrase into Google and take a look at the results. Third, look at the search results that appear. In the meta descriptions, you’ll see some of the words are bolded. In some cases, those words come straight from the keywords you put into the search function. Other times, they are related keywords. Extending the example above, the search results include bolded words like, “lawn,” “dying grass,” and “keep.” These are all words you should use in your content. Finally, make sure to click on the related searches. They can send you down a rabbit hole filled with more keywords as you continue to go to each new search results page and evaluate new results. Bonus Tip: Though it’s not really related to keywords, take a look at the top-performing AdWords ads. You can typically get some ideas for how to write your page title and meta description from here. Those ads are usually run through a series of A/B tests to determine what copy works best to garner clicks, and that’s something you’ll want to use to your advantage when writing page titles and meta descriptions. Caleb Malik Caleb Malik is a Sales Executive at SmartBug Media. Although he now works in sales, Caleb has an extensive background in managing digital strategy and inbound marketing, including SEO, paid media, content creation, analytics, and more. Read more articles by Caleb Malik.